Fourth Row Center: Film Writings by Jason Bailey: In Theaters: "Jean-Michel Basquiat: The Radiant Child"
His story has been told on screen before, in the biographical film Basquiat, directed by his friend and contemporary Julian Schnabel. Another friend, filmmaker Tamra Davis, shot footage of the artist at work, as well as an extended interview two years before his death. After he died, "I took all my footage and put in a drawer," where it was unseen for over 20 years. Now, thankfully, she has assembled that footage, and more, into the intimate and powerful documentary Jean-Michel Basquiat: The Radiant Child. The film's best movement is its first, a pulsing, fast-paced portrait of the NYC downtown art scene, circa the late 1970s and early 1980s. 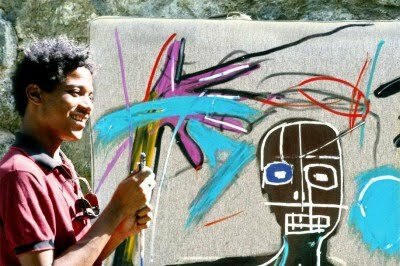 It was into this world that Basquiat moved from Brooklyn in 1978, first for the ingenious (and literate) graffiti messages that he and friend Al Diaz created and tagged as "SAMO." In that world, we're told, "everybody did everything"--you'd paint, you'd play in a band, you'd write, you'd act in films--so Basquiat started a band called Gray with other artists, appeared on the seminal downtown public-access show TV Party, and starred (basically playing himself) in the low-budget film Downtown 81. He was homeless and broke through most of this period; he remembers his "hustler living," surfing from couch to couch, sneaking on trains, living as a literal "starving artist." The film's tremendous energy doesn't falter during its chronicling of his fast rise in the art scene, as he goes from selling handmade $10 postcards to watching every piece sell in one night (for a total of $200,000) at his first solo show. He gets richer, he becomes a star, he befriends Warhol, he goes to L.A., he becomes (in the words of cultural historian Nelson George) "the center of a cult." But he remains an outsider in the snooty New York art scene, fighting the dull minimalism of the 1970s with his intricate, frequently complex pieces. Editor Alexis Spraic utilizes a zippy, layered, collaged sense of montage throughout (particularly in the snazzy opening credit sequence, which mixes up home video, 16mm footage, paintings, jittery type, and Dizzy Gillespie's "Salt Peanuts" with a wonderful, jazzy freedom). Davis and Spraic slip easily from topic to topic and theme to them; the way they slide into the discussion of his race, and the perception of it, is particularly impressive. But she tells some great stories (the stuff about his collaboration with Warhol is particularly interesting), and the film is, by turns, moody and thoughtful. Some of the explanations of his ultimately fatal addiction to heroin smack of excuse-making, but the look at his descent into drugs, loneliness, and dissatisfaction is visceral and powerful. More than anything, Jean-Michel Basquiat: The Radiant Child leaves the viewer with a real sense of knowing its subject; when we see its last close-up of Basquiat's smile, you genuinely feel the loss. "Jean-Michel Basquiat: The Radiant Child" opens Wednesday, July 21st at Film Forum in New York.